The Erskine was built from 1926 to 1930 in South Bend, Indiana as a subsidiary of the Studebaker Corporation. 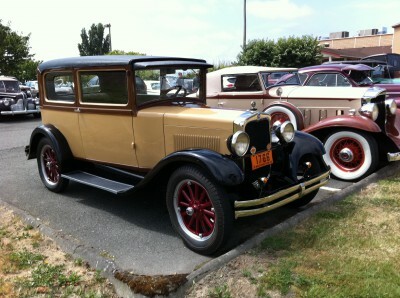 It was named after Albert R. Erskine who ran Studebaker from 1915 until 1933. Due to corporate financial problems, Mr. Erskine took his own life in 1933. The Erskine was originally intended to be in the low priced field, but at an average price of $975.00, it just couldn’t do very well as a Ford at that time ran about $500.00 and a full size Oldsmobile was $1195.00. 22,275 Erskines were produced in 1928 and featured a 3 speed transmissiopn and a 6 cylinder engine that developed 18.15 horsepower. This production number included all models for 1928.